Sometimes Mother Nature just throws you a bone. As community leaders fret about decreased revenue and are doing all they can to attract visitors and tourism dollars to McAllen — hosting over 220,000 people on Saturday for a successful holiday parade, and investing millions of dollars in upgrades to the mall — the tiniest of visitors migrate into our area and bring with them a following, a frenzy and tourism dollars. We’re talking about the Green-breasted Mango hummingbird and the Tiger Mimic-Queen butterfly, both of which are rare to this region and rarely stray over the border, yet have been spotted here. Recent citings of these species have brought with them an influx of tourists — some from as far away as Alaska. Many came quickly this week — prior to today’s shift in colder weather that could alter flying patterns — in hopes of catching a glimpse of them. The Green-breasted mango normally lives in Central and South America and in the western Carribean and breeds in Mexico, but it has only come into Texas about 20 times, according to the Audubon Field Map. The last time it was seen in the United States was 2009 in Louisiana and Texas. The bird was last in Hidalgo County in 2005. But this week at least one of these birds has been seen at Quinta Mazatlán multiple times and days and that has caused a flurry of activity in the birding world as die-hard conservationists have booked flights and made quick travel plans to get here to see it. 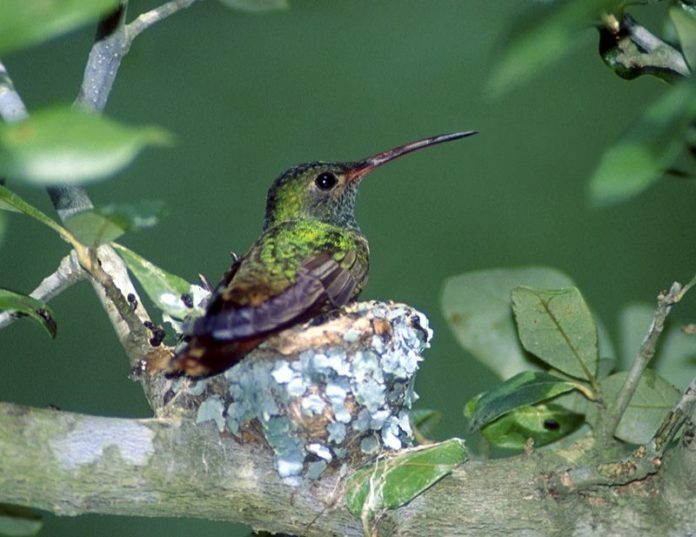 Deemed “large” by hummingbird standards, the 4.75-inch bird apparently fancies “foraging for insects around a large native Sugar Hackberry tree, flying up to 15 feet above the tree-line in pursuit of aerial insects,” according to a City of McAllen news release issued Tuesday. What’s more: In looking for these birds, birders spotted that rare butterfly, which also has only been seen in the United States a couple times.